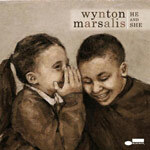 CD review: "He and She"
Give Wynton Marsalis credit  for someone who arrived on the national music scene in the early 1980s as the prototypical angry young man, he has shown tremendous ability to mellow, at least musically. If he is still a bit stubborn in his definition of just what constitutes jazz, he has also breathed new creativity into mainstream jazz through his own writing and performing. His latest album, "He and She," is clearly the product of a mature, middle-aged man  and one obviously at ease with having arrived at that stage in life. Still, it is not a staid album by any means. To begin with, it is held together by a topic concept rather than stylistic consistency  the forms of jazz found here range from old-timey honky tonk that would have fit comfortably in a Prohibition speakeasy ("School Boy") to the sophisticated West Coast after-hours jazz stylings of Vince Guaraldi ("Girls!") to Latin jazz ("First Time"). What holds the album together is the recitation of a poem of the same name as the album, Marsalis reading a few stanzas between the musical tracks. (The poem lays out Marsalis' thoughts on romance, and the whole dynamic between men and women.) The recitations sets the mood, then the music carries it out. Marsalis has long proved he can play any style on that horn of his, winning Grammy Awards in both classical and jazz. Here, he adds yet another twist to his catalog: Hard-charging Cuban jazz. "First Time" starts off with an atonal, arhythmic mish mash before an Afro-Cuban beat begins to manifest itself, and Marsalis breaks out into a gorgeous trumpet solo a la Arturo Sandoval with all that Caribbean coloring and bent notes on his horn, and then pianist Dan Nimmer leads the band into a tight rumba right out of the Mongo Santamaria catalogue.